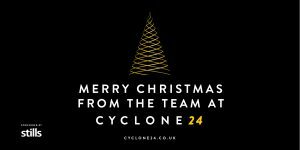 A very Merry Christmas from the Cyclone24 team. The Cyclone24 team would like to wish everyone a very merry Christmas and a happy and prosperous 2018! Our first Manchester challenge took place in May and with it came a new challenge record. The first ever 24 hour cycle to be held at The HSBC National Cycling Centre in Manchester, it saw riders of all ages and abilities hit the boards including European Track Champion Tim Lawson. The challenge was won by a team from online cycling magazine road.cc, led by captain Stu Kerton. The team cycled 3676 laps in total, not only making them champions of this event, but also taking them straight to the top as overall challenge record holders, beating the previous record of 3507 laps. 2017 also saw the launch of our monthly corporate cycle network from our base in Cardiff. 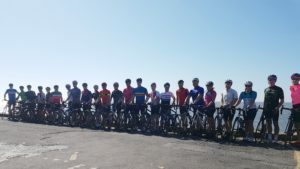 The inaugural ride took place in April where cyclists from businesses across the city joined our Director Zoe Westerman for an early morning ride around the Vale of Glamorgan, followed by breakfast which was kindly sponsored by Stills. The corporate cycle network takes place on the last Friday of each month and will run from March to September in 2018. Fresh from commentating on the Tour de France and Ride London, we were also lucky enough to have David Millar join us in September. Cyclone24 partnered with Brewin Dolphin & Darwin Gray to host a 105km ride through Cardiff and the Vale of Glamorgan with a route over the infamous Bwlch. Post ride there were some well earned beers, whilst David entertained our guests with a fascinating and very candid talk about his cycling career. October saw our 2017 Wales challenge held at Newport Velodrome, where another new challenge record was set! With 41 minutes left on the countdown clock the team from Kilsby Williams smashed through the existing challenge record of 3676 laps, and went on to finish the challenge completing 3792 laps – the new and current challenge record. We would like to congratulate everyone who took part in one of our challenges this year, and thank everyone who has supported our ventures. In particular we would like to say a huge thank you to our sponsor Stills Branding, and to our event support partners Bello Cyclist, Cardiff & Vale College and Agile Therapy. 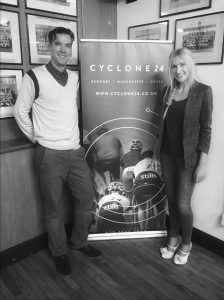 Finally, we were able to support some fantastic charities with Cyclone24 raising near £30,000 taking our fundraising total to over £95,000. It has been a fantastic 12 months and we are looking forward to sharing more news and adventures with you in the New Year. Stay tuned for more news in 2018! Safe Riding & Merry Christmas!